In this section, you will debug a Java program. In the Package Explorer view in the Java perspective, double-click junit.samples/VectorTest.java to open it in an editor. and double-click on the ruler to set a breakpoint. The breakpoint icon indicates the status of the breakpoint. The plain blue breakpoint icon indicates that the breakpoint has been set, but not yet installed. 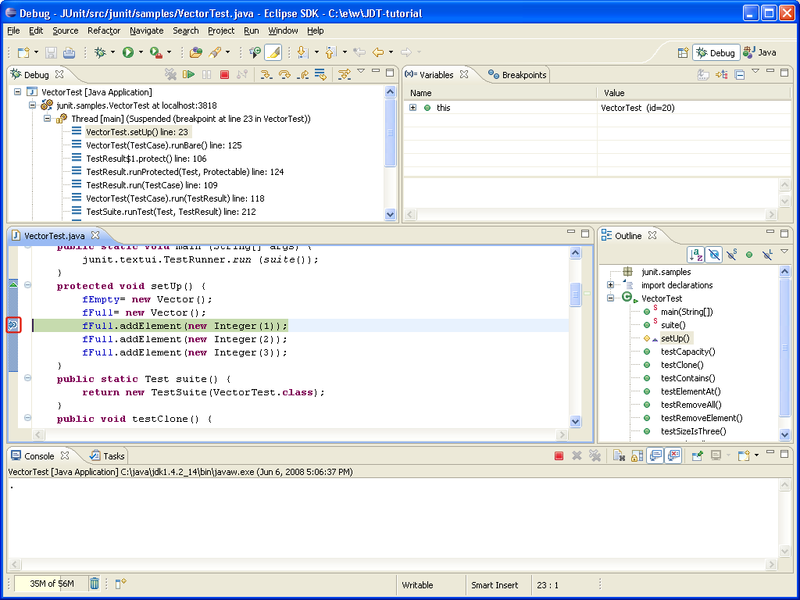 Note: Once the class is loaded by the Java VM, the breakpoint will be installed and a checkmark overlay will be displayed on the breakpoint icon. 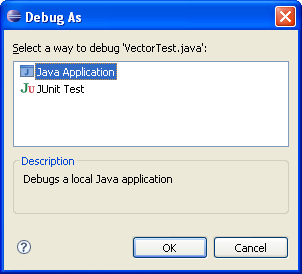 In the Package Explorer view, select the junit.samples package and select Debug As, and then Java Application. When you run a program from a package, you will be prompted to choose a type from all classes in the package that define a main method. 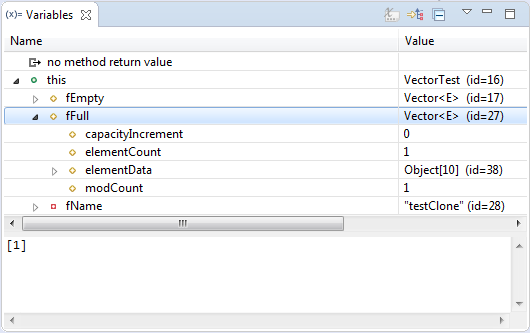 Select the VectorTest item in the dialog, then click OK. Note: You can also simply hit the debug button which will launch the currently selected resource or active editor. 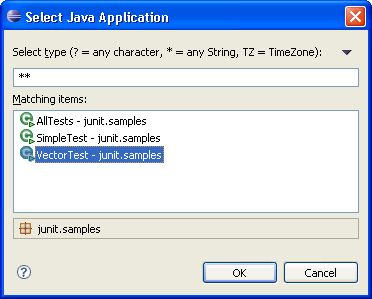 Select Java Application when you are prompted to select a way to debug VectorTest. The program will run until the breakpoint is reached. When the breakpoint is hit, execution is suspended, and you are asked whether to open the Debug perspective. Click Yes. Notice that the process is still active (not terminated) in the Debug view. Other threads might still be running. 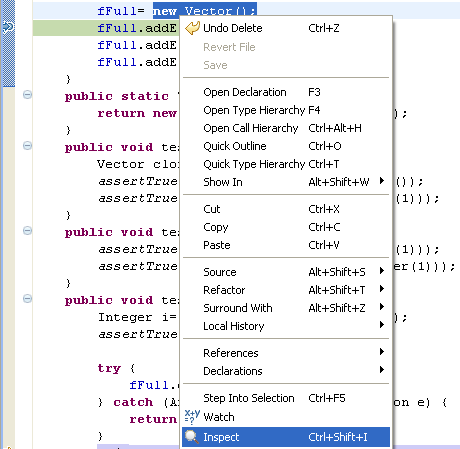 Note: The breakpoint now has a checkmark overlay since the class VectorTest was loaded in the Java VM. In the editor in the Debug perspective, select new Vector() from the line above where the breakpoint is set, and from its context menu, select Inspect. The expression is evaluated in the context of the current stack frame, and a pop-up appears which displays the results. You can send a result to the Expressions view by pressing the key binding displayed in the pop-up. Expressions that you evaluate while debugging a program will be listed in this view. To delete an expression after working with it, select the expression and choose Remove from its context menu. 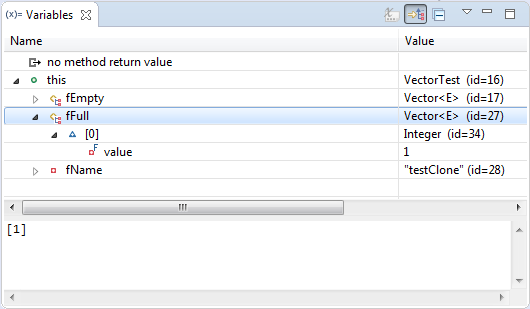 The Variables view (available on a tab along with the Expressions view) displays the values of the variables in the selected stack frame. Expand the this.fFull tree in the Variables view until you can see value. The variables (e.g., no of elements) in the Variables view will change when you step through VectorTest in the Debug view. To step through the code, click the Step Over ( ) button. Execution will continue at the next line in the same method (or, if you are at the end of a method, it will continue in the method from which the current method was called). The variables view shows certain types as Logical Structures.You can define logical structures by yourself in the preference page Java > Debug > Logical Structures. You can choose to disable Show Logical Structure to show the implementation details of these types. Try some other step buttons (Step Into , Step Return ) to step through the code. Note the differences in stepping techniques. You can end a debugging session by allowing the program to run to completion or by terminating it. You can continue to step over the code with the Step buttons until the program completes. You can click the Resume ( ) button to allow the program to run until the next breakpoint is encountered or until the program is completed. You can select Terminate from the context menu of the program's process in the Debug view to terminate the program.